There’s an old joke in hockey: “Goaltending is 50% of the game unless you don’t get it, then it’s 90% of the game.” Since the retirement of Miikka Kiprusoff in 2013, you could make an argument that goaltending has occupied the minds of Calgary Flames hockey operations staffers roughly 90% of the time. 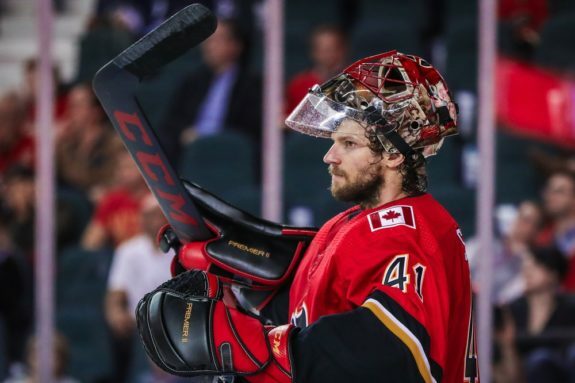 But the 2017-18 season saw the acquisition of Mike Smith, whose play in the first half of the season was occasionally reminiscent of Kiprusoff’s past prowess. Coming off an injury last winter that derailed Smith’s season, the Flames are putting a lot of effort into keeping him fresh but issues with their defensive zone play have clouded their plan’s effectiveness. After spending the off-season changing up their forward ranks, and with injuries and impressive camps injecting some youth into their defensive group, the Flames are a much different team than they were a year ago. The only area they haven’t changed is their goaltending, as they brought back last season’s tandem of Smith and backup David Rittich. Smith’s age and recent injury history has been well-documented: he turns 37 in March and has missed time due to lower body injuries in each of the past three seasons. Despite his injury history, he’s become accustomed to playing a lot and has been an effective netminder when he’s been fresh and healthy. #Flames puck-stopping plan for two-game trip — Mike Smith faces Maple Leafs, David Rittich starts against Sabres. The Flames seem committed to keeping Smith fresh this season by using Rittich early and often – based on current projections, Rittich seems on pace to play around 25 games and Smith around 57. The balancing act seems smart, but measuring its effectiveness – how well Smith can play consistently – is a challenge given the defensive zone challenges the Flames have experienced thus far. The goaltender should make saves, but the skaters should do their best to minimize the number and quality of the chances allowed. The goaltender should do their best to minimize booting out juicy rebounds, but the skaters should have enough tactical control of the area in the slot that if any rebounds get booted out they’re able to clear them easily. As with anything else, there’s always a gap between theory and practice, but the teams that make life easier on their goaltenders make it easier for all involved to have success. In part because of roster turnover and a new coaching staff, the Flames have faced challenges making life easy for their goaltenders. Based somewhat on the system he used with the Hurricanes, new Flames head coach Bill Peters utilizes a system not unlike used by former coach Glen Gulutzan. Both rely upon puck possession and an active forecheck, but Peters’ defensive zone breakouts rely upon all five skaters staying in a relatively tight five-man unit. Quick passes are used to move the puck out of the zone rapidly – ideally catching the opposition’s players flat-footed and creating odd-man rushes and scoring chances. The five-man units also minimize the distance between players for passes and the likelihood that the passes will be intercepted. However, a system that relies on fast breakouts might have a tendency to incentivize cheating – forwards breaking formation and leaving the defensive zone early to maximize space on their odd-man rushes. Players cheating the formation can lead to passes being intercepted and odd-man rushes coming back against the goaltender, resulting in lots of high-quality chances against. Between a new coaching staff and a bevy of new faces, this has frequently been the case for the Flames. The team’s defensive zone performance through 11 games has drawn criticism from Peters, and the criticism seems merited: on a per-60-minutes basis the Flames allow the 4th-most scoring chances and the most high danger scoring chances in the NHL – per Natural Stat Trick’s data. On Oct. 25, the Flames suffered a 9-1 loss to the Pittsburgh Penguins – the club’s worst home loss in roughly two decades. Smith allowed six goals and under different circumstances might’ve been a prime target for post-game criticism. But Peters took the high road given the defensive miscues in front of Smith. More than 10% through the schedule, the Flames need to get a handle on their defensive zone play – if only so the coaching staff will be able to reliably evaluate Smith’s performances and make adjusts to their goaltending plan as needed. Given the importance of goaltending to their on-ice success, cleaning up their defensive play could make or break their entire season.